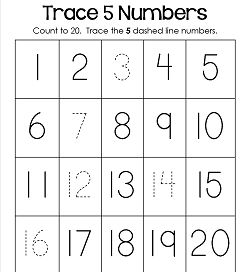 These trace numbers worksheets meet the Common Core standard for writing to 20, but are specifically created for practice forming and tracing numbers 1-20. Use them from the first worksheet to the last one, working up from just tracing 5 numbers for beginners (or those with very short attention spans!) to tracing all the numbers. Great for differentiated learning and the various needs of your students. 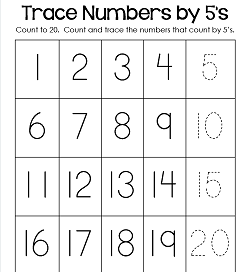 And of course, to help kids write the numbers correctly instead of backwards! Have kids count as they trace the numbers. 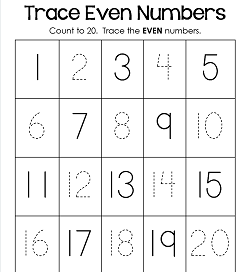 Please go to this page to see my blog post Tracing Numbers 1-20 Worksheets about this set of worksheets or this page to see all the kindergarten number worksheets on this site. This is just a beginner worksheet for tracing 1-20. Kids can count all the way to 20, but trace 5 of the numbers. Here’s an idea! Trace the numbers in rainbow colors. 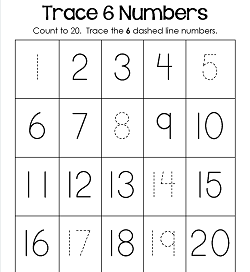 This tracing numbers worksheet with 6 numbers to trace is perfect practice for kids who may have more of a handle on counting than writing numbers. Tracing these 10 random numbers is fairly easy for beginners, but gives them a good place to start. It’s a great companion to the other worksheets in this set, too. 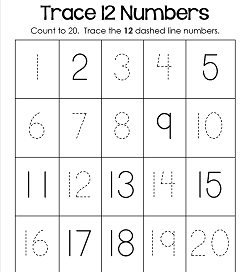 With only 12 dashed numbers to trace, you can use this worksheet to continue to ease kids into tracing all the numbers. 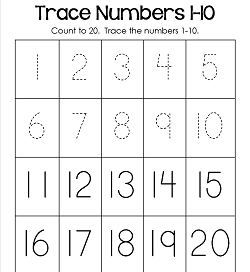 With only 5 numbers that don’t need to be traced, this trace numbers 1-20 page can be used for kids who aren’t ready to trace quite all the numbers yet. 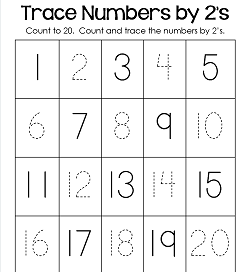 Count and trace all the numbers 1-20 on this worksheet. Use as classroom practice for all students, fast finishers, or several times a year for assessment purposes. 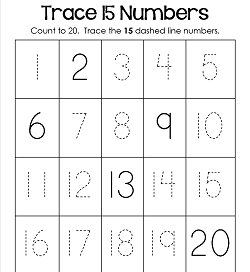 In this worksheet kids count from 1 to 20 then trace only the numbers 1-10. 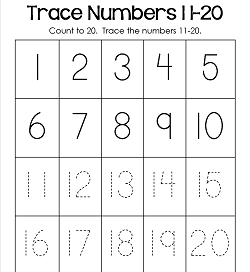 Here’s a great worksheet for counting to 20 and then tracing only the numbers 11-20. Good for teaching kids about the teen numbers. 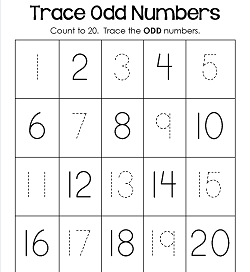 If you happen to teach kids even and odd numbers at an early age, this is the perfect worksheet to trace even numbers. If not, it’s still a good worksheet for tracing practice! 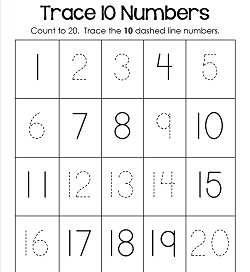 Like salt and pepper, this trace numbers 1-20 worksheet with only odd numbers that can be traced goes hand in hand with the trace the even numbers worksheet. Great for your lessons about counting by 2s, kids count by ones from 1-20, then trace only the dashed line numbers. Kids can count by 2s, too! For your lessons about counting by 5s – Kids count by ones from 1-20, then trace only the dashed line numbers. Kids can count by 5s, too. 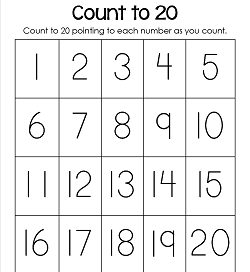 This Count to 20 chart is a great tool to use in math centers. 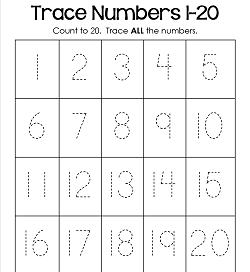 Copy one for each of your kids to have at their desks to practice counting to 20.